ESPN Adds Two Sunday Night Baseball Telecasts in September Including 2018 Season Finale - ESPN Press Room U.S.
ESPN today announced two additional matchups for its exclusive Sunday Night Baseball presented by Taco Bell national game of the week, including the 2018 season finale. The Boston Red Sox and Mookie Betts will visit the Cleveland Indians and José Ramírez in a battle of American League division leaders on September 23 at a special 7 p.m. ET start time on ESPN. Both Clubs are managed by former ESPN analysts, Alex Cora (Boston) and Terry Francona (Cleveland). Francona was also the Red Sox manager when Cora played for the team from 2005-08. The week prior, on September 16, the St. Louis Cardinals and Matt Carpenter will host the Los Angeles Dodgers and Matt Kemp in a game that will likely have MLB Postseason implications in the National League, at 8 p.m. on ESPN. The Sunday Night Baseball commentator team of play-by-play voice Matt Vasgersian, analysts Alex Rodriguez and Jessica Mendoza and reporter Buster Olney will have the call of both late-season, marquee matchups. Also, ESPN’s Baseball Tonight: Sunday Night Countdown presented by Chevrolet will precede each game with a 60-minute pre-game show breaking down the top highlights and key storylines from around the league. On deck: This weekend, the American League West-leading Houston Astros and Alex Bregman will host the Los Angeles Angels and Mike Trout on the September 2 edition of Sunday Night Baseball. Vasgersian, Rodriguez, Mendoza and Olney will have the call at 8 p.m. on ESPN. Baseball Tonight: Sunday Night Countdown will lead into the game at 7 p.m. on ESPN. Sunday Night Baseball is also available on ESPN Radio, ESPN Deportes and ESPN Deportes Radio. 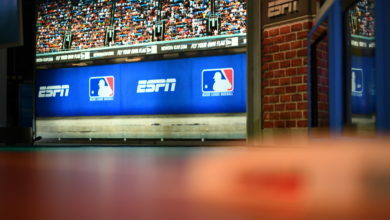 All ESPN MLB games and studio shows are also available streaming on the ESPN App.